Local 71 Members Ratify New State of Alaska Contract, Through 2021! ANCHORAGE, AK--- Members of the Public Employees Local 71: Labor, Trades, & Crafts have voted to ratify a new employment contract with the State of Alaska. Public Employees Local 71: Labor, Trades, & Crafts certified ratification of a newly negotiated State of Alaska contract today in Anchorage. Dennis Moen, Business Manager, offered special thanks to the Negotiations Team: Jordan Adams, Tom Brice, Trenton English, Cathy Lavender, Todd Peplow, Phil Petrie, Tracy Smith, and all the Members who put the time and effort into sending recommendations to the team. Reaching final agreement took all Legislative Session, with lots of negotiation meetings. Dennis noted that he met personally with the Governor, Commissioners and Deputy Commissioners multiple times to get our points across. 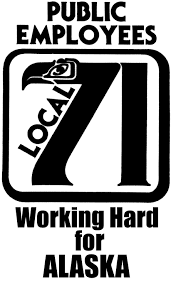 Local 71 was not willing to finalize a Tentative Agreement until we had the best possible contract during Alaska’s fiscal crisis. Dennis said: “This contract was negotiated by Members for Members. I’m proud and appreciative of the hard work and dedication the team brought to these negotiations. Alaskans have not faced this fiscal uncertainty of this magnitude since the mid 80’s. We believe our state will be on better financial footing when we meet for the next contract in the fall of 2020. More information may be found at www.local71.com/agreements or our Facebook page.